Almost three weeks I’ve been away — west to British Columbia and then east to Ontario — and in the true spirit of Away, I’ve not been blogging, except for that quick previous post about history meeting and history making on June 5. I like to concentrate on holidays or visits or whatever it is that takes me away. But my neglect also reflects the zone I still inhabit technologically. Blogging adheres to my writing work, which in its turn adheres to places and routines such as my home office, my own desk and computer, a particular view out the window, and the hours I give to being in that room, fed by thoughts gathered in the daily rituals of kitchen and yard and relationships, and in books undertaken in my several favourite reading spots. In other words, blogging — for me — isn’t handheld yet, isn’t easily portable. Back, and so much richer for all that’s happened while away. It’s a little like the experience of the foursome in Elizabeth Hay’s Late Nights on Air who make a long trip by water and canoe across a piece of the Arctic, mostly alone in the barrens but then for a few hours surrounded by hundreds of caribou. Nothing for so long, and then abundance, and then nothing again, but a nothing haunted by the previous abundance. My “previous abundance”? Well, for openers, the birth of our newest granddaughter, Clara June on the 11th. Every birth is a story which could be told from any number of perspectives — the mother’s, the father’s, the siblings’, the midwife’s, the child’s — but from this grandmother’s point of view, Clara’s arrival was also the fulfillment of a wish I’d set on to a mental “bucket list” of sorts, which was to witness a birth. I attended the births of our three children, of course, but was much too engrossed in getting the thing done to look into the mirror which, I was later told, hung strategically above me, or to imagine myself into some observer’s view of what was going on. 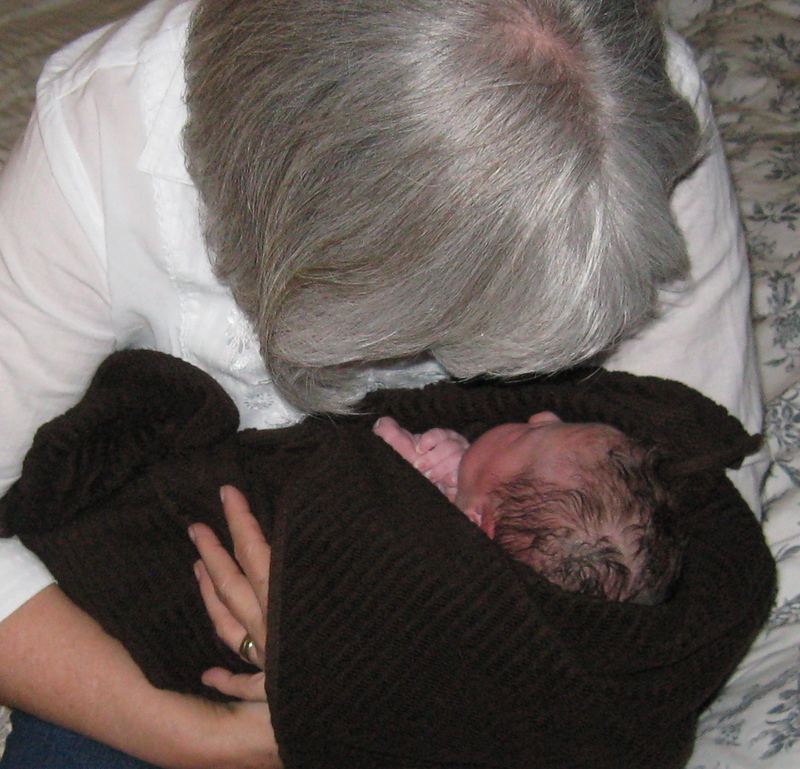 I can’t say that I feel more bonded with Clara than our other five grandchildren because I saw her arrival, for the bond is strong with each one of them, but I would say that seeing the miracle of birth from a view this close and personal haunts me with unusual gratitude and awe. And will, I suspect, for a long time. While I was staying at our children’s house, a dear aunt for whom my husband and I had some responsibility in her elder years, had a stroke, and about a week later — the night between my return from B.C. 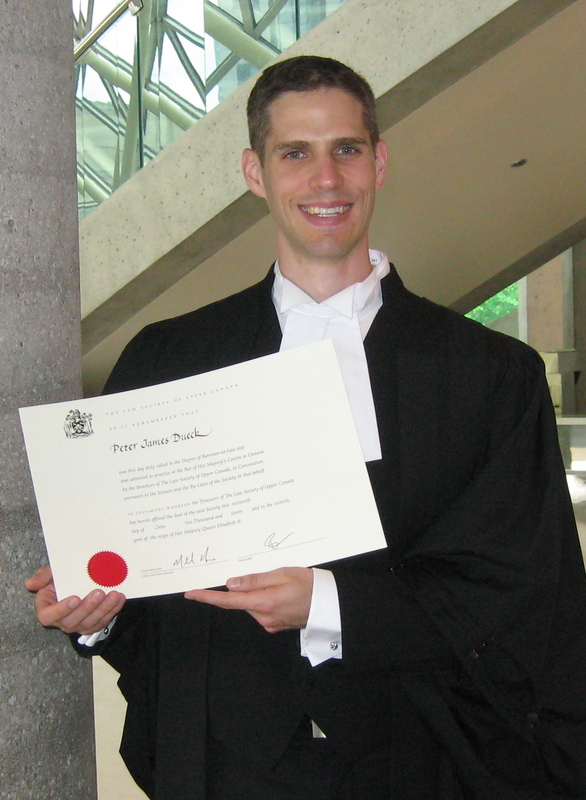 and H. and I leaving for Ontario, where son P. was celebrating his call-to-the-bar ceremony — she died. That evening between the two trips, we sat with her for awhile, and watched and listened while she, by now unconscious, underwent the labour of death. It was noisy too. Not groans in this case, but the struggle of painful breath — a struggle to keep going mixed with a struggle to stop. It too gave way to other sound some hours later, for her attendant while she died that night said our aunt had become ever more quiet in these efforts, until she was peacefully still. A legal achievement to celebrate! How grateful we are for four enjoyable days in Toronto, celebrating a professional milestone with our son and daughter-in-law (which also fell on his birthday), as well as our (now) second youngest granddaughter’s “dedication” in their church (which also fell on Father’s Day). It was wonderful to mark these occasions together and a bonus that they so conveniently bunched themselves together. The notable sounds across these days were those of pomp and ceremony, speeches, applause, laughter, and prayers for little Holly Anastasia. Meanwhile, back in Winnipeg, other family members made funeral preparations. I’m glad the day chosen made it possible for us to attend. It was my privilege to read aunt Gertrude (Harder) Klassen’s life story at the service. Such a fragment it is, an obituary, even when enlarged for the funeral service with more commentary than a newspaper obituary or funeral bulletin allows. A last, tiny edit of 87 years, spoken aloud. My aunt’s life touched me in significant ways, but perhaps I’ll save that for a subsequent post. I’m back home, after all, back in blogging zone! This entry was posted in Death, Family, Personal and tagged celebrating milestones, Gertrude Harder Klassen, witnessing birth, witnessing death by doradueck. Bookmark the permalink. Welcome back, Dora. What powerful, primal, experiences you have had. I was there in the room with you, having also welcomed a grandson at the same time my aunt Lois was dying. Thanks, Shirley. Interesting that you had an overlap of these experiences recently as well. It may be more common than I realize, and it occurs to me that the coming and going we partake of may help us stay centered somehow, realistic but hopeful.